In true Hongkers fashion, the weather seems to have turned – quite literally – overnight, which means tackling the city in a rather fiery 30+ degrees and 95% humidity, for the next few months. Oh, joy. Sadly, we can no seek solace in layers and light jackets (those few weeks in January were blissful, in that respect) and, ready or not, the summer bods are going to be on show for the foreseeable future. Whether you’re swapping your tailored suits for lighter office attire or, spending your weekends bikini-clad on board a junk, we all want to feel more confident in skimpier clothing. With this in mind, the usual dilemma looms: choosing a fitness regime that is effective, sustainable and suitable for your lifestyle. Oh, and fun! 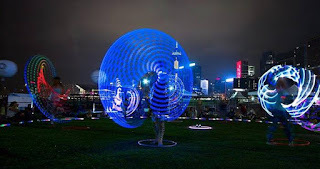 So, you can imagine my excitement when I heard about Turning Circles: a hoop dance fitness class that claims to deliver total body tone using a hoola hoop and whatever moves you’ve got in your repertoire! Now, I am certainly no Beyonce and am somewhat, er, challenged in the coordination department. Needless to say, I was a little dubious and slightly intimated by the prospect of shaking my thang in Tamar Park; in full view of commuters and evening runners. However, it definitely sounded like a better option than pounding the treadmill and trudging through squat and lunge series because, seriously, ain’t nobody got time for that. Turning Circles was founded by Emma Brown: an expert hooper and international yogi. 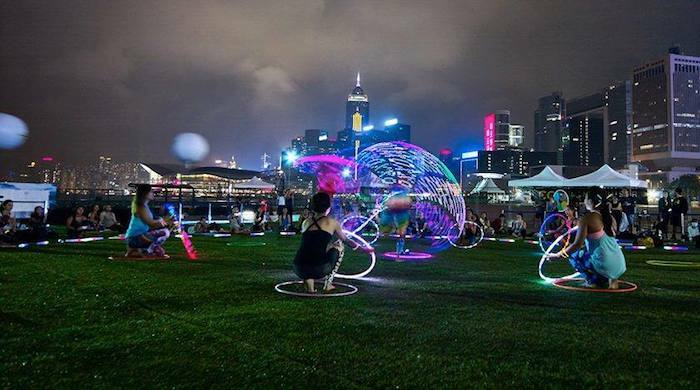 Emma brought her love of hooping to HK and tapped into the community here to establish regular practice groups and meet-ups, before turning her passion project into a business. This girl’s got serious game! 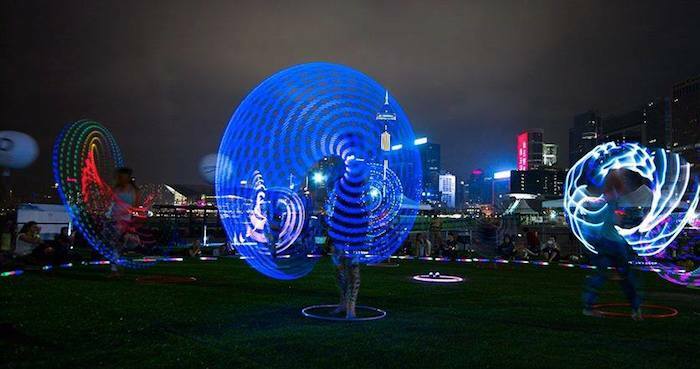 Emma caters for both adult and kid-friendly hooping sessions and is also available to perform and showcase her incredible skills at events. Trust me, this is something to see! Turning Circles can also create an exclusive program for a special occasion or gathering, which I slyly noted for my friend’s upcoming hen party. I think this would be a super fun way to let loose at your next girlie get together and make some room for treats and bubbles later on! The 60-minute class was the perfect balance of total body cardio, strength and core training as well as targeting flexibility, balance and stability. 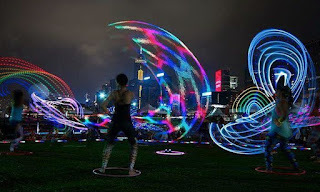 The nature of hooping is light, enjoyable and entertaining; it’s more about organic movement than strict choreography. With this in mind, it is so easy to underestimate this as an easy, flighty workout that is not worth getting kitted out for. I can safely say though that this is much harder than it looks and I certainly felt the burn in my core and shoulders the next day. 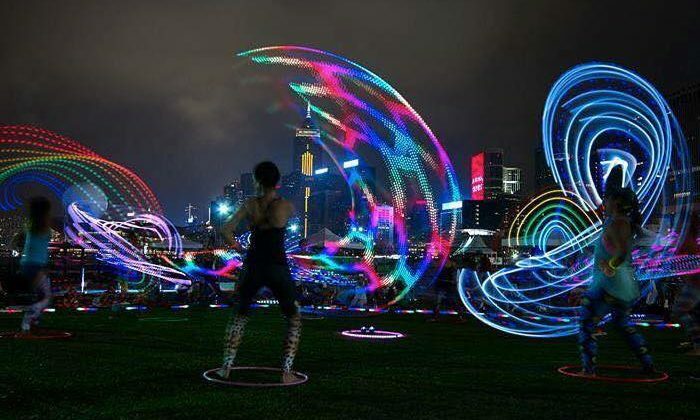 Massive props to Emma and the more advanced hoopers in the class! The group setting was really motivating and we were all able to laugh at ourselves, which made everyone feel much more at ease with this alternative way of working out. 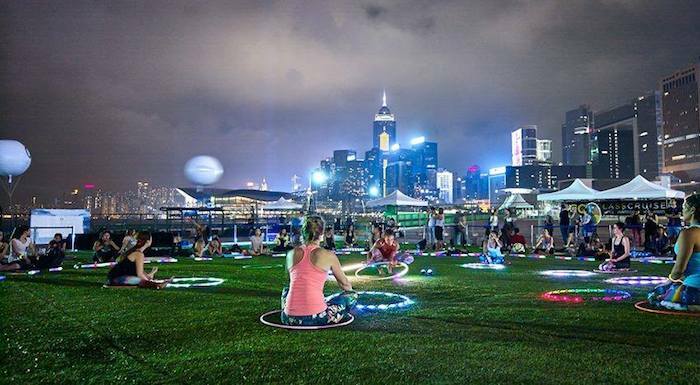 The setting of the class is sublime and the backdrop of the technicolour skyline adds to the magic of the Turning Circles experience. 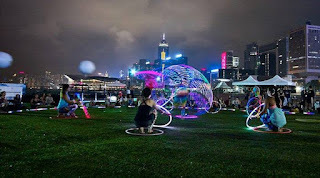 The evening felt dreamlike as we gaily danced around barefoot on the grass, turning and jumping through sparkly hoops and giggling like school kids. Afterwards, I felt totally revitalised and skipped happily home with an extra pep in my step. 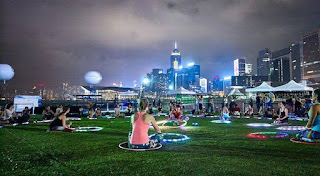 Turning Circles offers a first trial class for just HK$100, as well as a number of different package options. If you prefer something a little more exotic, Turning Circles are partnering with Divine Light Yoga this summer to create their first Hoop and Yoga Retreat which offers one week of yoga and hoola hoop dance classes, accompanied by healthy food and great company, to fuel all of that activity. If you’re up for improving your creativity, concentration and coordination, we suggest booking tickets to experience love and laughter in the blissful location of Koh Samui. All images courtesy of Turning Circles.